Winslow Jackson met his wife, Dorothy, in 2006. He was divorced. She was widowed. And they both had Multiple Sclerosis. 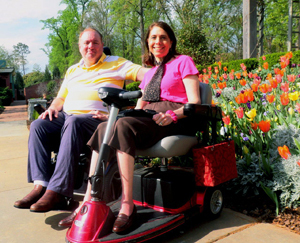 While receiving rehabilitative care at an Atlanta hospital, they connected. And at StoryCorps, the couple remembered what drew them to each other. This story is also included in All There Is: Love Stories from StoryCorps. Originally aired March 23, 2012 on NPR’s Morning Edition. Winslow Jackson (WJ): On my birthday, I was diagnosed with Multiple Sclerosis; three years later, my wife left, and we were divorced. And that was, undoubtedly, the saddest time of my life, because I felt so stranded. DJ: I thought, well, I’d heard lines like this before, but this time it was different. We talked for 15 or 20 minutes. And I found out that he also had MS.
WJ: So, we dated–oh, let’s say maybe a year and a half–and the question came up, ”Well, how can two people with MS ever survive together?” And this has been the real miracle of our relationship. WJ: I’ve pushed her many times [laughs]. DJ: …and I’ve pulled you! WJ: Well, true. Fortunately, today, they have medications out that can almost stop the progression of MS. So, my symptoms have not really changed in the last ten years. I certainly am very hopeful that my wife will not worsen either. DJ: We’d like to think that we’re setting good examples of how to live life. WJ: Well Dorothy, I want to thank you so much for being with me and being my true love. DJ: You’re so much fun to be with. I look forward to continuing to seeing the world with you.